Our website address is: https://chesschampions.org. 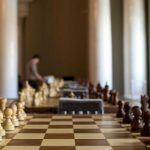 We collect data from the contact forms strictly for the purpose of providing notifications regarding local tournaments and other items of local chess interest. You can opt out at any time and we never sell your email address. We use Google Analytics to analyze usage data. We don’t share your data with anyone other than for the purposes stated in other sections. We never sell your data.